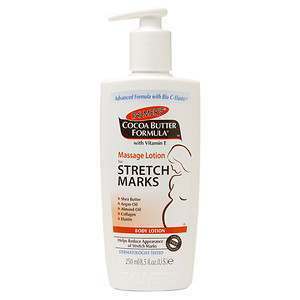 This product review gives you all the crucial information about Palmer’s Cocoa Butter Formula Massage Lotion for Stretch Marks. This lotion purports to have a special combination of ingredients that reduce stretch mark appearance in the course of pregnancy, after pregnancy, and during weight fluctuations. It also improves your skin’s suppleness and elasticity. Read on to learn more about this lotion. Cocoa Butter- acts as a natural skin moisturizer. It keeps your skin silky and soft. It works on the rough and dry areas of the skin. Hydrolyzed Elastin and Collagen- help your skin to remain firm, stretchable, elastic, and supple. In addition, these ingredients improve your skin’s tone and appearance. Vitamin E– has antioxidant capabilities. It improves the look of scars, striae, and skin imperfections. It also maintains an even skin tone. Centella Asiatica- rejuvenates and protects elastin fibers and collagen. Sweet Almond- has emollient properties. It is non-greasy and can be absorbed easily by the skin. It moisturizes the skin and reduces the likelihood of developing scars and marks. Argan Oil- contains vitamin E, important antioxidants, and fatty acids. It acts as a skin softener and conditioner. It also reduces scarring. Apply all over your body three times daily to keep your skin elastic and supple. Focus on areas that are likely to develop stretch marks such as the hips, tummy, bust, and thighs. Discontinue use and consult a physician in case of a rash or irritation. This product claims to be dermatologist tested and hypoallergenic. It does not contain any parabens or phthalates. Hypoallergenic means that this product is unlikely to cause allergic reactions when used. However, given that skin sensitivity increases during pregnancy, it is advisable to test the lotion on a small area such as the forearm and wait for 48 hours to see if it causes unwanted reactions. The price of one bottle (250 ml) ranges from about $4 to about $8 depending on the seller. The price of this product is lower than competitors and therefore makes it more affordable. It is questionable that there is no information about a satisfaction guarantee to show the manufacturer’s confidence in this product. Nevertheless, the available customer reviews show that most customers are satisfied with the results. This product has a powerful blend of ingredients that are effective in reducing stretch marks and rejuvenating the skin. The positive features of this lotion include numerous positive testimonials and a low risk of experiencing unwanted effects. However, this product has no satisfaction guarantee and its low price might raise quality-related issues. As a result, there a variety of other stretch mark treatments that may be better suited to your needs. David Carney	reviewed Palmer’s Cocoa Butter Formula Massage Lotion for Stretch Marks	on August 15th	 and gave it a rating of 2.5.